Alongside our instructor licensing & certification we understand that your club, no matter how big or how small, can really benefit from whole club licensing. Club Licensing is about recognising trading names, training names or other gyms / dojos as an independent entity separate to that of the instructor. 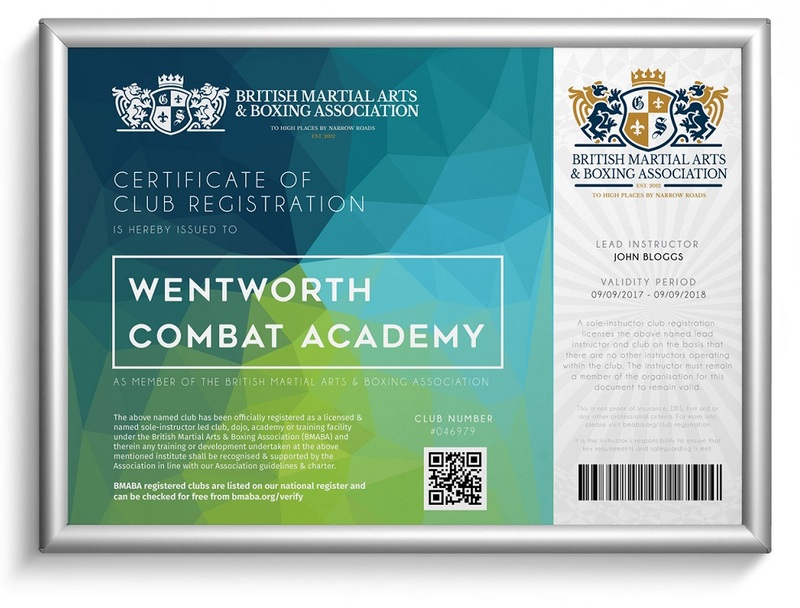 It’s great for clearly showing your club is licensed, alongside your self as an instructor and our martial arts club licensing will help you do just that. Club licensing isn’t compulsory, and you’re under no obligation to register your club with us if you would rather remain as just a licensed instructor. The introduction of our club licensing facility is in direct response to requests from our instructors. It’s simple to register your club and it’s affordable, too. It’s not an exclusive service for larger gyms – the cost is proportionate to to the size of your club and the number of instructors you have. We offer sole instructor club licensing and multi instructor club licensing to better cater for the needs of clubs, dojos and training facilities that vary in size. 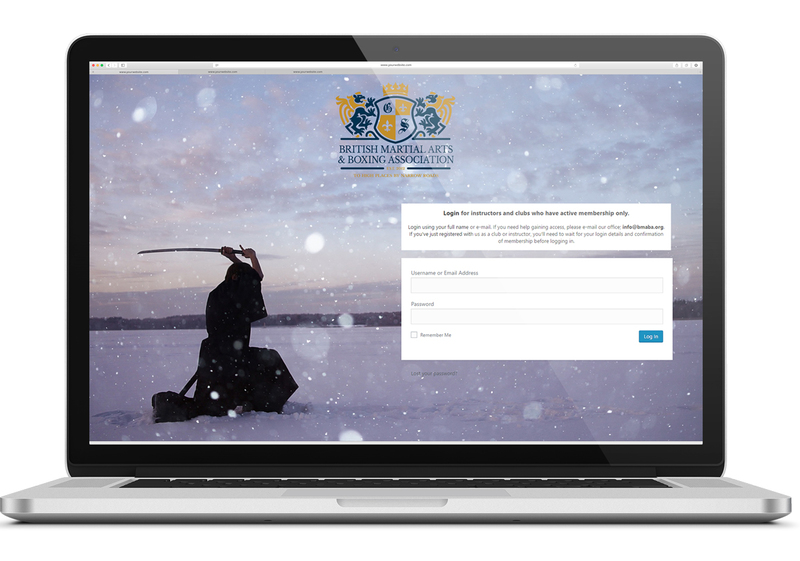 How Does Our Martial Arts Club Licensing Work? Lots of our members have enjoyed professional BMABA affiliation, but wish to also have their named club properly licensed through our body too. For multi-instructor schools it’s even more important; lots of individually recognised instructors is fine, but it’s always nice to conclude all individual registrations into a single club licensing certificate that will allow your named club to be checked online. For example, if you run a club named ‘Abinger Combat’ and you’re an instructor named ‘John Bloggs’, although you’re licensed and recognised (and therefore as a sole instructor we’re happy to recognise your club as a non-named club) there’s nothing to certify Abinger Combat when it’s searched for online or via our database. Club licensing allows your named club, gym or business to enjoy named affiliation and licensing under our organisation. Does Club Licensing Replace Individual Instructor Licensing? No – it’s not a replacement. It’s designed to compliment an individual instructor’s certification and membership. You’ll need to be a member of our association as an instructor before you’re eligible to apply for club licensing. Is there a minimum club size to qualify for club licensing? There’s no minimum size. We look after clubs of all sizes – from small single instructor clubs through to large national gyms. Everyone has the same equal opportunities to enjoy our high quality club licensing awards. First things first, you’ll need to register as an individual member of our association. We work to license and recognise people as individual instructors – it makes the whole process much easier to manage and much harder to fraudulently get through. First things first, in order to register your club with us, you’ll need to join our association. Once you’ve successfully registered as a member of our organisation you may begin the application process of applying to be a licensed BMABA club. You don’t need to be teaching at this point, so you won’t yet need to have submitted DBS checks, first aid qualifications or other professional supporting evidence for yourself, which means you get register your club immediately after joining. Once you’ve entered your application for club licensing, it’s time to get professional. If you’re not already teaching you’ll now need to meet the same standards as those clubs who are already established. We have some prescribed club standards which work to actively encourage a professional, safe training environment. Some of this guidance is available from this page of our website & the rest can be viewed upon application. If you have more than one instructor at your club they’ll also need to be individually licensed through our association. Each instructor teaching at a club must provide proof of the instructor’s standards expectations, which can be viewed here & include a DBS check, first aid training, proof of grade and some form of insurance. This also ensures each instructor is licensed & registered with our organisation as an independent instructor. Once you’ve registered any additional instructors and provided proof of a range of professional criteria (such as a child protection policy, proof of insurance, health & safety record keeping etc) you’ll be invited to complete a short online assessment. Once completed, we’re able to award you with your club licensing award. Club Licensing Is Exclusively Available To BMABA Members. Join Us To Certify Your Club. What Club Licensing Is Available? Our Sole Instructor licensing option is designed specifically for singular clubs whom don’t have multiple teaching staff. It’s quicker to achieve and doesn’t include quite so much administrative work, as it’s effectively licensed directly against the main instructor’s qualifications, credentials and status. It’s an excellent way of ensuring your club name is licensed and recognised when your student’s search for it online. Our Multi-Instructor Club Licensing Award is designed for all clubs, training facilities & dojos with more than one instructor teaching. You don’t need to be running a limited company or a full time dojo in order to quality – you simply must have more than one instructor teaching under the club banner. The club registration certificate is designed to ensure all of the essential club standards are being met, alongside acting as an administrative assistant to the lead instructor in terms of ensuring all individual instructors are fully insured, licensed & checked. 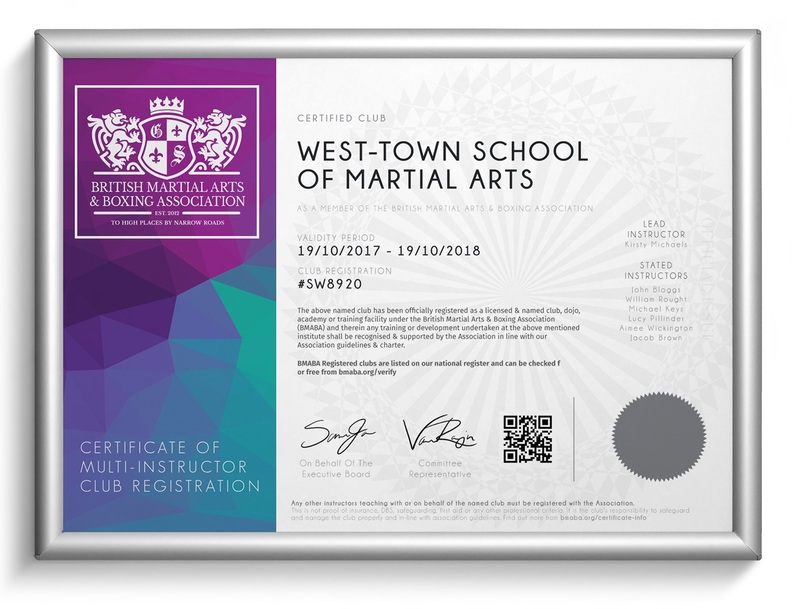 The certificate, when checked, will list all of the additionally named instructors (and trainee instructors) currently licensed under the club name, allowing potential students, customers or parents the opportunity to confirm an instructor’s right to teach instantly and online, 24/7, 365 days a year – even as they step onto the mats!